When we took the girls to Medieval Times a few weeks back, we decided to play tourist in Chicago that day since our show didn't start until late that evening. We ended up taking our bikes with us to save on taxi and parking fees. I do want to point out that they do offer bike rentals in the city for $7 per day. Had we known that ahead of time, we would have saved the headache of loading and unloading our bikes from the car. Anyhow, one of our first stops was the Lincoln Park Zoo. We have been to this zoo many times before, and it never gets old. The thing we really like about the visit, is entrance is completely FREE! If you drive in and park, you will get charged about $20 for parking, but since we rode our bikes, we didn't pay anything for our visit. The first stop for us is always my favorite- the gorilla house! 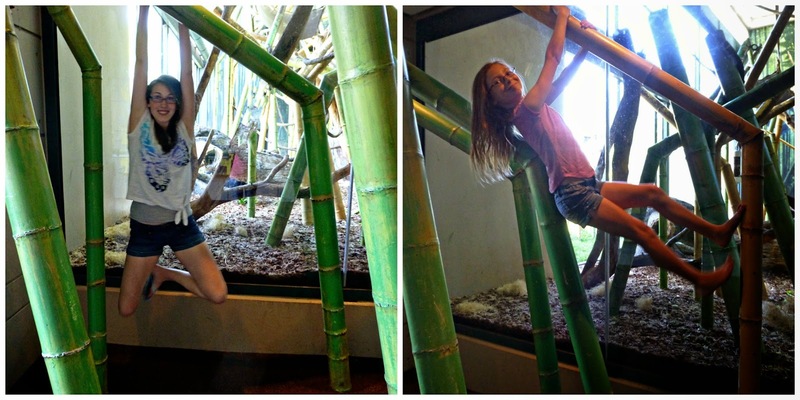 The girls like to test their climbing abilities on the bamboo poles. There's a striking comparison here, I'd say! The rainforest section is really fun to go through. With mini waterfalls, lots of birds, and this awesome aquarium to gaze at. Even though the zoo is free, it is certainly not lacking on animal exhibits. I honestly think this is one of the better zoos in terms of which animals they have on exhibit that we have ever been to. Since we were short on time, we only stopped at our favorite exhibits that day, but I'd say plan on a good 2 hours to go through the entire zoo when you visit. Lincoln Park Zoo is located at 2001 N. Clark Street, Chicago IL 60614. What are some of your favorite exhibits at the zoo? I love Lincoln Park Zoo. It is one of my favorite Chicago destinations (that plus the Art Institute). Cool to see a bear, there are none in New Zealand zoos. Agreed on the Art Institute. It's been a year since we visited there, and I still think about it! This looks like an amazing zoo. Great pic. of the girls with that lion and I love the one of the giraffe too! There's a bear again. I keep seeing them all the time since we ran over one. Speed bump gone wild! Our zoo was rated number 1 in the world! It seems crazy. My favorite animal has to be the koala bear. They are just so cute! I've heard it's a great zoo to visit. I'm not surprised about the parking, it costs a small fortune to park anywhere in Chicago, lol. To me, it's worth it though, Chicago is one of my most favorite cities, and I'd love to visit the zoo! Looks like you had a great day with the girls! Summer is more than half gone :( Way to make the most of it! That looks like a nice zoo. We always buy zoo passes here, but we have only been twice this year I think. I was going to take Elliott tomorrow while we are having work done on our car but it's supposed to be really hot, so I don't really want to be out in it after all. Our favorites are the otters, penguins, and camels. The otters and penguins still hadn't returned yet last time we were there. They went away 3 years ago when we had our major flood, and their stuff took the longest to fix back up. Lincoln Park is our favorite, too. Closer than Brookfield, cheaper and much better visibility to most of the exhibits. It looks like you had a fun time! the zoo looks really interesting. reminds me of the London zoo. I love all the pictures looks like everyone had a great time! I love going to our local zoo but we've been there so much I would love to be able to check out another city's zoo! Great shots of the animals, they almost look fake! Looks like a fun time, the zoo is always a blast. Looks like a fun , sunny day! What a fun zoo! I like older zoos, you feel like you're closer up to animals. I love seeing the giraffes - they're so pretty! That looks like a ton of fun! I love zoos of any kind. awe! So much fun! We need to visit the zoo again soon! Love it! The Lincoln Park Zoo looks great. I'd love to visit there some time. I love animals. That looks like a fun zoo and great pics! We have Henry Doorly about 5 minutes from home and visit often! It's been so long since my family has visited a zoo. I wish we could have made it there before school starts up again. Maybe during winter break! I have driven past this zoo several times, but never stopped. I'll have to put it on the to-do list for our next visit! My family and I always enjoy visiting zoos on any vacations! We are huge animal lovers. I'm glad you guys had a fun time! This zoo looks like a great one! We plan on going to Chicago soon, so we will definitely have to make a stop at Lincoln Park Zoo! Pictures are great. It looks like a lot of fun there. Love zoos. We love going to the zoo. This looks like a good one. I love the zoo! It's my favourite summer activity. I love all the pictures you shared. What a fun zoo outing! My boys love the penguins at ours. I love that there were giraffes and also fish. I love the aquarium but we don't have one nearby. I wish my zoo was a combination of the two! Looks like you had a great time! I love going to the zoo. We love the penguin exhibits. Such fun to take the kids to the zoo. The giraffe is so cute! Makes me want to go to a zoo. So fun! I love giraffes so much. Heading to our zoo the last week of Aug, can't wait! I love animals so much! This looks like a great zoo that is well taken care of! That is cool that it is so interactive! That looks like a great zoo! I love your pictures. The fish wall is my favorite one. Looks like everyone had a great time. Thanks for sharing. Wow it looks pretty good and the animals look healthy! Amazing that it's also free!! That looks like a fun zoo. I love the giraffes! That looks like an awesome zoo! One of the few things Memphis does well is zoos. We have a great zoo here. Of course, a lot of the people who live here act like wild animals so I guess it somehow makes sense that the actual animals in our zoo would be pretty cool. I love that photo of the giraffe. Looks like you had a great time! I love the zoo! Giraffes are my favorite, they are so beautiful! I haven't been to Chicago in a while and your pictures are making me want to go. We went to the Atlanta Zoo this summer but I don't think my family is a big zoo family. We love the Lincoln Park Zoo, such a great spot in the city! Trying to get to the Science and Industry with the kid before summer ends! What an awesome zoo! My kids are such big fans of checking out different zoos! They would love the Lincoln zoo! We were at the Bronx Zoo about a month ago. Man was it a lot of walking and more walking. It has been whispered... that belong in a zoo. My boys love spending the day at the zoo. It looks like your little ladies had a great day there. Looks like an enjoyable time. I always like going to the zoo. That bear pic is pretty awesome.